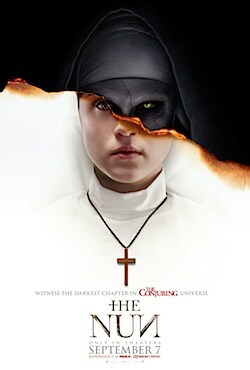 The Nun is the fifth movie in the Conjuring universe. It is the very definition of A Studio Horror, in which an ancient demon is summoned into the body of a middle-aged woman in an Eastern European convent, and is so furious at this that it then goes a bit mad and kills pretty much everyone at every opportunity. For obvious reasons the Vatican isn't too happy at the ruckus being caused, so they send Father Burke (Demián Bichir) to investigate with a collection of suitcases, accompanied for reasons which really aren't made clear by prospective good-nun Sister Irene (Taissa Farmiga*2). Hell on. It's the kind of film where a French-Canadian farmer living in Romania answers the door to a pair of strangers by speaking in English. The range of accents here is astounding. The film's basically fine if that's what you're into. But as is so often the case, you'd have to be pretty new to the genre to be wrapped up in anything it has to say. At this point in the ongoing Conjuring saga, the storyline itself is almost completely linear. But wearing the continuity badge upfront like a press-pass, at least that's expected. If anything, I'd much rather have this movie be middling as part of a series than standing alone thinking it's better than it is. 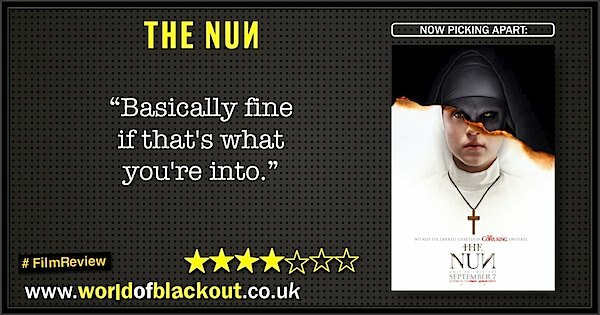 The Nun is well enough assembled, but in a way that suggests no-one involved believed they were making something unique, so just didn't try. The wardrobe and set-dressing are nothing less than meticulous, yet I still didn't believe for a single frame that this was taking place 66 years ago*3. Oh, and when the power is pulled from a radio, the music will just cease, it doesn't drop in speed and pitch like a turntable. Not even in 1952. Although I'm also aware that nothing else in that particular sequence makes sense either. The Conjuring series has been up and down like a rollercoaster, but this is an absolute ghost train of a movie. With dusty tombs, papal crisis meetings, an Act II backstory exposition reel and more jump-scares you can throw a crucifix at, it's more a tribute to the genre than a pastiche, but still made with a knowing glint in its eye. And with its motifs of guilt and possession in a Romanian setting, The Nun owes as much to Bram Stoker as it does William Friedkin. Oh, and when farmer Terry is walking around the catacombs with the flaming torch in the film's crescendo? The audience can see where the inbuilt gas jets are, mate. Still, the bits with the pentacles made me laugh. I mean out loud*4. The Nun is much like the cave on Dagobah. Well let's take a wild guess, shall we? Well, not unless you're a hardened fan of the series. Not unless you're a hardened fan of the series. Level 1: Rogue One Dr. Evazan's in this.